Do you have belts you don’t wear just hanging out in your closet? If so, I’m going to give you nine tips and tricks on how to wear women’s belts. But first, my own closet confession. This monster ball of belts was located in my closet. Okay not exactly as you see it but they were hanging on a hook organizer that eventually became useless since most of them were hidden underneath the other belts. Obviously, I forgot about most of them. Out of sight…out of mind. That’s how it is, sometimes you buy ’em and fuggetaboutem! So, in staying true to my mantra of wearing what’s already in my closet, I dumped my belts, if nothing other than to just say hi to them. No really, I needed to revisit my collection to see what I actually had. This gave me a visual so I could have the idea in my head for the next opportunity to wear one. Later that evening, I found my chance and wore one for date night 🙂 (Ah hem, before make up tho, lol) I tell you I would not have worn that belt if I hadn’t of dumped them earlier. Intention is powerful! 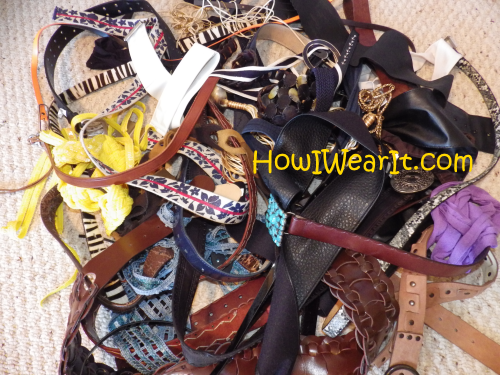 Here are nine tips & tricks for wearing women’s belts! Belts can be used for more than just belt loops you know. You can wear them as an accessory, accentuate your curves or create the illustion of curves. The next time you get dressed, think about trying one of these tips and adding a belt in a way you’ve never worn before. Hi-Low Dress with Belt Accessory! Wear high on torso or under bustline! Add a wider belt for a bold statement! 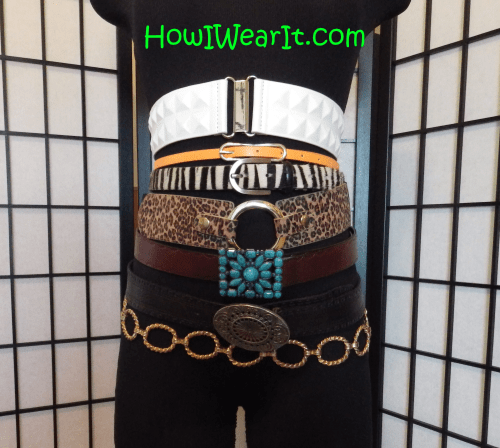 Wide belts cinch the waist! Sneak some print in with a belt! Highlight a pretty buckled belt by turning to one side! Initially too large but I made it work for me! A chain belt can be worn with ANY color 😉 This is the silver side. Add a belt to your blazer to up your office-style ante! Create a waistline through that suit! Color coordinate with a belt! Transform an outfit with a belt! Try adding a low waist belt to your tank top! In this case, with a maxi skirt also! Belt your favorite sweater or cardigan! This dress did not come with a belt so I used my own! What are some of your favorite ways to wear belts? Am I the only one to forget my belts? Super duper cute especially the brown one with the turquoise beads.